Roy Huff’s Everville: The Fall of Brackenbone is the fourth book in the Everville series. Two worlds are forever connected; Everville, the magical land of vapor-filled Them, giants, Ubaloos, shape-changing Alarian dragons, Mountain Dwellers, and the natural realm of Earth. Mallory was defeated in the last battle and restoration has begun on both Earth and Everville. Those captured and sent away have returned. However, Owen Sage’s last quest, although heroic, changed history, time as been altered. All must adapt to the new normal. Years have passed in Everville, but on Earth only a matter of weeks. Owen and his friends, Dante and Anika, are eager to resume classes at Easton Falls University. Although evil has been vanquished, there still remains unrest in both worlds. Something sinister is stirring. There is an imbalance, something strange is happening to the element. The fate of the entire world is at stake. The Keeper sends Owen once again on a quest for truth. Owen must find the cause for the reduction in the amount and power of the element. The Fourth Pillar of Truth holds the answer; he must find it before it is too late. 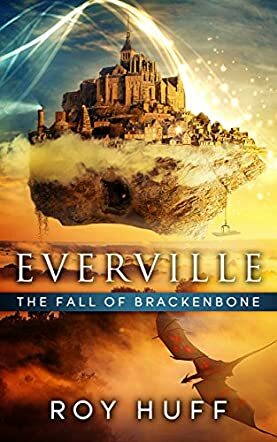 Everville: The Fall of Brackenbone gives a fantastical explanation of the anthropology and evolution of mankind. Roy Huff uses unusual and mystical language to enhance the level of his magical land. His writing style has an artistic flow of words, creating exquisite and poetic imagery. Opening wide the door of imagination, Huff writes delightful and whimsical couplets: “musings and plottings,” “schemings and waitings,” “cunnings and trinkets,” “thinkings without blinkings.” Furthermore, comments such as, “We are between here and there, yesterday and tomorrow, and yet, and yet,” remind the reader that we are not in Kansas anymore. Influences of Tolkien and CS Lewis subtly shadow Huff’s writing style. Moral truths, ancient and sage wisdom are in abundance. Far from being hum-drum or predictable, the setting and action shift in a blink of an eye. Everville: The Fall of Brackenbone is young adult fiction at its best. Roy Huff exposes greed and the lust for power, and defeats them with a quest for truth, knowledge, understanding and wisdom. Everville: The Fall of Brackenbone by Roy Huff is the story of Owen Sage, a normal guy, but the responsibilities on his shoulders are too big for words. Owen Sage is the one person who can save both Easton Falls University and Everville. They are both in dire need of a hero who is courageous and smart, and who can stop the vindictive Governor Jahal. He is joined by his once-enemy to find the Fourth Pillar of Truth and triumph over a wide range of scary challenges that will make anyone’s legs shake. With dragons and many other mythical creatures in the way, it will take strength and wisdom to win this chaotic war. Does Owen have the strength to fight all that alone? Can he trust his former foe and his new allies to help him on the way? Or will he become a prey of betrayal and pay the price with his life and with the end of Everville and Easton Falls University? Everville: The Fall of Brackenbone by Roy Huff is the fourth installment in his Everville series. I have been a faithful fan of this series since Everville: The First Pillar was released. I am in awe of Huff’s writing style and the way he portrays his characters. Owen’s character is developing in every single novel and I really loved this. You can feel Owen and relate to him in difficult situations. He shows emotions and you can almost taste them. The novel can be a little bit confusing for the new reader because of time travelling and portals, but if you read the novel in the chronological order (or pay close attention), you will not be confused. You will love it, like I do. Everville: The Fall of Brackenbone by Roy Huff is a book that takes us into two very different worlds that both need a hero. Easton Falls University and the magical realm of Everville are those lands. When Owen Sage takes on a journey that is epic in order to save not just one world but both, he has to not only fight for them but he has to fight to keep the world inside himself intact. Only the bravest will succeed in this quest and only a part of the feat is finding the Fourth Pillar of Truth. As if his quest was not enough, he has to outsmart a powerful villain by the name of Governor Jahal; can he manage to do all of this and come out okay? The first thing I must say is this is the first book in this series that I have read. The second is that the writing in this book is positively fantastic. There are not many truly original feeling YA books out there right now, but this has to be one of them. The worlds created within the pages of this book by author Roy Huff are rich and interesting with characters that fit the mold. Owen Sage is a true and noble hero in my eyes and a character that I felt connected with. He is not perfect by any means, he has his faults like the rest of us, but he truly does his best against impossible odds. This is a well crafted book that has been handled with a deft and perfect hand. I would happily recommend this one to any friends of mine.